Distribution of Paleolithic settlements in Europe. According to Stephen Oppenheimer, from c. 16,000 BC, the warmer climate allowed the expansion of proto-Basque groups, or proto-Europeans, across the north of Africa and the entire continent of Europe,[page needed] expanding the Magdalenian culture across Europe. In 2008, the Finnish linguist Kalevi Wiik proposed that the current Basque language is the remainder of a group of "Basque languages" that were spoken in the Paleolithic throughout western Europe and that retreated with the progress of the Indo-European languages. Wiik states that his theory coincides with the homogeneous distribution of the Haplogroup R1b in Atlantic Europe. Ludomir R. Lozny states that "Wiik's controversial ideas are rejected by the majority of the scholarly community, but they have attracted the enormous interest of a wider audience." In May 2012, the National Geographic Society Genographic Project released a study that showed through detailed DNA analysis of samples from French and Spanish Basque regions that Basques share unique genetic patterns that distinguish them from the surrounding non-Basque populations. The results of the study clearly support the hypothesis of a partial genetic continuity of contemporary Basques with the preceding Paleolithic/Mesolithic settlers of their homeland. Paleogenetic investigations by the Complutense University of Madrid indicate that the Basque people have a genetic profile coincident with the rest of the European population and that goes back to Prehistoric times. The haplotype of the mitochondrial DNA known as U5 entered in Europe during the Upper Paleolithic and developed varieties as the U8a, native of the Basque Country, which is considered to be Prehistoric, and as the J group, which is also frequent in the Basque population. The works of Alzualde A, Izagirre N, Alonso S, Alonso A, de la Rua C. about mitochondrial DNA of the Human remains found in the Prehistoric graveyard of Alaieta, in Alava, note that there are no differences between these remains and others found across Atlantic Europe. Studies based on the Y chromosome genetically relate the Basques with the Celtic, Welsh, and Irish; Stephen Oppenheimer from the University of Oxford says that the current inhabitants of the British Isles have their origin in the Basque refuge during the last Ice age. Oppenheimer reached this conclusion through the study of correspondences in the frequencies of genetic markers between various European regions. The haplogroup R1b can be found most frequently in the Basque Country (91%), Wales (89%) and Ireland (81%). The current population of the R1b in western Europe are almost totally R1b1c (R1b1b2 or R1b3). They repopulated Western Europe. The rare variety R1b1c4 (R1b1b2a2c) has almost always been found among the Basque people, both in the Northern and Southern Basque Country. The variety R1b1c6 (R1b1b2a2d) registers a high incidence in the Basque population, 19%. The Y-DNA haplogroup R-M269 (R1b1a2) is also prominent among the Bashkirs of Volga. On the other hand, the geneticist Spencer Wells, director of the Genographic Project, has pointed out that the Basques are genetically indistinguishable from the rest of Iberians, a result that was confirmed in 2010 by a study led by Jaume Bertranpetit, at the Pompeu Fabra University, in Barcelona. Similarly, in 2015, a new scientific study of Basque DNA was published which seems to indicate that Basques are descendants of Neolithic farmers who mixed with local hunters before becoming genetically isolated from the rest of Europe for millennia. Mattias Jakobsson from Uppsala University in Sweden analysed genetic material from eight Stone Age human skeletons found in El Portalón Cavern in Atapuerca, northern Spain. These individuals lived between 3,500 and 5,500 years ago, after the transition to farming in southwest Europe. The results show that these early Iberian farmers are the closest ancestors to present-day Basques. The official findings were published in Proceedings of the National Academy of Sciences of the United States of America. "Our results show that the Basques trace their ancestry to early farming groups from Iberia, which contradicts previous views of them being a remnant population that trace their ancestry to Mesolithic hunter-gatherer groups," says Prof. Jakobsson. In the field of linguistics, there are two lines of investigation, both based on etymology; one on toponyms, not only in the Basque Country but also in the rest of the Iberian Peninsula and Europe, and the other on the etymology of Basque words. Theories regarding the possibility of such a shared root have been put forward by Louis Lucien Bonaparte, Miguel de Unamuno, Julio Caro Baroja and others. One inference of these hypothetical and controversial etymologies was that some aspects of the Basque language had been stable and uninfluenced by other languages since the Stone Age. However, these etymologies are now doubted by mainstream vasconists. Aizkora has been identified as a loan from the Latin asciola. The root of the remaining terms – based on the Roncalese dialect, which is known for its preservation of historical nasals and has the documented forms antzur, ainzter, aintzur and ainzto – was ainz- and thus the reconstructed root was *ani(t)z or *ane(t)z. There are no traces of such a nasal sound in the word haitz "rock" (cf. Roncalese aitz). 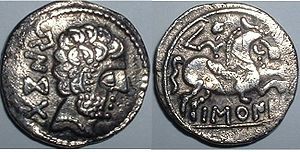 Sides of an Iberian coin with the inscription Baskunes. The theory of the Basque-Iberism claims that there is a direct relationship between the Basque language and the Iberian language, meaning either that Basque evolved out of the Iberian language, or that its precursor belonged to the same language family. The first author to suggest this theory was Strabo in the 1st century BC (at a time when the Iberian language was still spoken); he asserted that the Iberians and the Aquitanians were similar physically and that they spoke similar languages and had similar customs. Some researchers have propounded the similarities between the Basque language and the Caucasian languages, especially the Georgian language. The comparison between the matrilineal and patrilineal DNA of the native peoples from the Basque Country and Georgia has allowed the discovery of significant differences. The hypothesis that related both populations is only based on the typological similarities, which is never a good marker of linguistic kinship. These superficial similarities in the linguistic typologies do not seem to accompany a genetic relation at a population level. The possible relation between Basque and the languages of the Caucasus is denied by authors such as Larry Trask, who stated that the comparisons were wrongly made, given the fact that the Basque language was compared with several Caucasian languages at the same time. 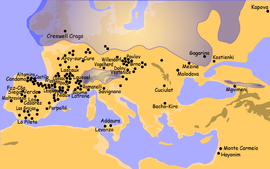 These theories are based on the Old European hydronymy, assuming that the first inhabitants of Europe spoke a common tongue or languages of the same language family. This theory is not accepted by most linguists, who believe that, in a territory as large as Europe, more than one language had to be spoken. Much of the names of settlements, rivers, mountains, valleys and landscapes in Europe would have their origin in Pre-Indo-European languages, specifically the Basque language. We do not fall in exaggeration if we say that all the Europeans are Basques. According to Vennemann, the Proto-Basque language (or a language family from which the Basque language originated) was the linguistic stratum in which the Indo-European languages later settled. He found, among other examples, the Basque words "ibai" (river) and "ibar" (bottom) to repeat continuously in European rivers, or the word "haran" (valley) in toponyms such as Val d'Aran, Arendal, Arundel, Arnach, Arnsberg, Aresburg, Ahrensburg, Aranbach or Arnstein. The Vennemann theory has been criticized by Basque scholars and it is not accepted by most linguists. Specifically, Trask, after many pointed critiques of the methods employed, affirmed that Vennemann had found an agglutinative language, but with no relation to the Basque language, and that probably it is simply the Indo-European language, as many other linguistic scholars agree. Joseba Andoni Lakarra, a researcher of the Proto-Basque language, criticizes the thesis of Vennemann, saying, like Trask, that he identifies modern Basque roots that are not related to the archaic Basque. In the same way, Lakarra says that, despite Basque now being an agglutinative language, there are reasons to believe that previously it was not so. The early story of the Basque people was recorded by Roman classical writers, historians and geographers, such as Pliny the Elder, Strabo, Ptolemy and Pomponius Mela. The present-day Basque Country was, by the time of the Roman arrival in the Iberian Peninsula, inhabited by Aquitanian and Celtic tribes. The Aquitanians are also known[by whom?] as the "Proto-Basque people", and included several tribes, such as the Vascones, who were located at both sides of the western Pyrenees. In present-day Biscay, Gipuzkoa, and Álava were located the Caristii, Varduli, and Autrigones, whose origin is still not clear. It is not known if these tribes were of Aquitanian origin, related to the Vascones, or if they were of Celtic origin. The latter seems more likely, based on the use of Celtic and Proto-Celtic toponyms by these tribes. These tribes would have then gone through a Basquisation, caused by progress of the Aquitanian tribes on their territory. Strabo in the 1st century AD reported that the Ouaskonous (Vascones) inhabited the area around the town of Pompelo, and the coastal town of Oiasona in Hispania. He also mentioned other tribes between them and the Cantabrians: the Varduli, Caristii, and Autrigones. About a century later, Ptolemy also listed the coastal Oeasso beside the Pyrénées to the Vascones, together with 15 inland towns, including Pompelon. Pompelo/Pompelon is easily identified as modern-day Pamplona, Navarre. The border port of Irún, where a Roman harbour and other remains have been uncovered, is the accepted identification of the coastal town mentioned by Strabo and Ptolemy. Three inscriptions in an early form of Basque found in eastern Navarre can be associated with the Vascones. However, the Vascones appear to have been just one tribe within a wider language community. Across the border in what is now France, the Aquitani tribes of Gascony spoke a language different from the Celts and were more like the Iberi. Although no complete inscription in their language survives, a number of personal names were recorded in Latin inscriptions, which attest to Aquitanian being the precursor of modern Basque (this extinct Aquitanian language should not be confused with Occitan, a Romance language spoken in Aquitaine since the beginning of the Middle Ages). Between the 14th and 15th century, a series of historical legends were created with the objective of defending the singularity of the Basque people and their Fuero system, which regulated the relations between the Basque territories and the Crown. Among these legends are the Basque-Iberism, the Basque-Cantabrism, and The Battle of Arrigorriaga. These legends were used in a context of political vindication. In the 19th century, the Basque nationalists would use these legends as the basis for their vindications. Developed by Esteban de Garibay and Andrés Poza, this legend states that the Basque people are direct descendants of Tubal, grandson of Noah, fifth son of Japheth. According to the legend, Japheth and his tribe, the Iberians, departed to the Iberian Peninsula, settling between the Pyrenees and the river Ebro, right after the confusion of languages in the Tower of Babel. Then, the Basque language would be one of the 72 languages that were created as a punishment of God after the Tower of Babel. It is based on a historical and geographical distortion of the Cantabrian Wars, based on a manuscript gloss that Cristóbal de Mieres, secretary of Lope García de Salazar (1399–1476) introduced on a 1491 copy of Las bienandanzas e fortunas. This legend makes the Vascones the protagonists of these wars. ^ Karmele Artetxe Sánchez (2005): «Egungo euskoiberismoa, berrikuspen historiografikotik abiatuz», Kondaira 3, 2005, 1-53, ISSN 1698-9287. ^ Karmele Artetxe Sánchez (1999): «Egungo euskoiberismoari buruzko zenbait ohar», Euskonews & Media 54, 1999-11-12. The most plausible candidates for the ancient languages of the Iberian refuge are the Basque languages still spoken by about half a million people in the Basque area of Spain and France. Earlier, there were several languages belonging to this language group, but mainly because of the intensive spread of IE languages in Western Europe, the area of the Basque languages has shrunk ever since. It is probable that the entire Atlantic Coast was linguistically Basque during the Last Glacial Maximum (LGM) and the millennia after it. The area was homogeneous also in respect to subsistence system and genetics: the men were reindeer hunters and their main Y-chromosome haplogroup was R1b. ^ Lozny, Ludomir R (2011). Comparative Archaeologies: A Sociological View of the Science of the Past. Springer. p. 156. ISBN 978-1-4419-8224-7. ^ Dupandunlop, Isabelle; et al. (2004). "Estimating the impact of prehistoric admixture in the genome of Europeans". Molecular Biology and Evolution. 21 (7): 1361–1372. doi:10.1093/molbev/msh135. PMID 15044595. ^ Maca-Meyer, N.; González, A.M.; Larruga, J.M. ; Flores, C. y; Cabrera, V.M. (2001). "Linajes mayores del genoma mitocondrial trazan antiguas expansiones humanas" [Major genomic mitochondrial lineages delineate early human expansions]. BMC Genetics. 2: 13. doi:10.1186/1471-2156-2-13. PMC 55343. PMID 11553319. ^ a b Alfonso-Sánchez, M.A. ; Cardoso, S.; Martínez-Bouzas, C.; Peña, J. A.; Herrera, R. J.; Castro, A.; Fernández-Fernández, I.; Pancorbo, M. De (2008). "Mitochondrial DNA haplogroup diversity in Basques: A reassessment based on HVI and HVII polymorphisms". American Journal of Human Biology. 20 (2): 154–164. doi:10.1002/ajhb.20706. ^ Genes link Celts to Basques "On the Y-chromosome, the Celtic populations turn out to be statistically indistinguishable from the Basques," Professor Goldstein said. ^ Karaet, Tatiana; et al. (2008). "New binary polymorphisms reshape and increase the resolution of the human Y chromosomal haplogroup tree". Genome Research. 18: 830–838. doi:10.1101/gr.7172008. PMC 2336805. PMID 18385274. ^ Rosser, Zoë H.; et al. (2000). "Y-Chromosomal Diversity in Europe Is Clinal and Influenced Primarily by Geography, Rather than by Language". The American Journal of Human Genetics. 67 (6): 1526–1543. doi:10.1086/316890. PMC 1287948. PMID 11078479. ^ Lobov A.. et al. (2005) "Y chromosome analysis in subpopulations of Bashkirs from Russia"
^ Domínguez, Nuño (19 February 2010). "Los genes de los vascos no son diferentes". El Público (in Spanish). Archived from the original on 21 February 2010. Retrieved 21 February 2010. ^ Ancient DNA Elucidates Basque Origins. Researchers find that the people of northern Spain and southern France are an amalgam of early Iberian farmers and local hunters. By Bob Grant | September 9, 2015, thescientist.com. ^ Ancient DNA cracks puzzle of Basque origins, BBC, 7 September 2015. ^ Ancient genomes link early farmers from Atapuerca in Spain to modern-day Basques, September 9, 2015, pnas.org. ^ Ancient genomes link early farmers to Basques, phys.org, September 7, 2015. ^ Trask, L.† (edited by Max W. Wheeler) (2008): Etymological Dictionary of Basque, University of Sussex (unfinished). ^ Strabo, Geography, III, 4.10. ^ Ptolemy, Geography, II, 5: Tarraconensis Hispania. ^ R.J.A. Talbert, Barrington Atlas of the Greek and Roman World (2000); J. Santos Yanguas, Identificación de las ciudades antiguas de Álava, Guipúzcoa y Vizcaya: Estado de la cuestión, Studia Historica: Historia Antigua, vol. 6 (1988), pp. 121-130; J.L. Ramirez Sádaba, Las ciudades Vasconas segun las fuentes literarias y su evolucion en la tardoantigüedad, Antigüedad y Cristianismo (Murcia), vol. 23 (2006), pp. 185-199. ^ R. L. Trask, The History of Basque (1997), chapter 6. ^ Strabo, Geography, book 4, chapter 2. ^ a b Bazán y Otros, Iñaki (2006). CIUDAD:Madrid EDITORIAL: La esfera de los libros (ed.). De Túbal a Aitor. Historia de Vasconia. ISBN 84-9734-570-3. This page was last edited on 28 March 2019, at 06:58 (UTC).